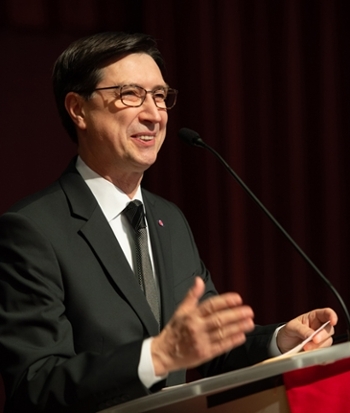 Southern Illinois University Edwardsville’s largest academic unit, the College of Arts and Sciences (CAS), recognized distinguished students and the profound impact of donor generosity during its annual Honors Day held Sunday, April 14 in the Morris University Center’s Meridian Ballroom. 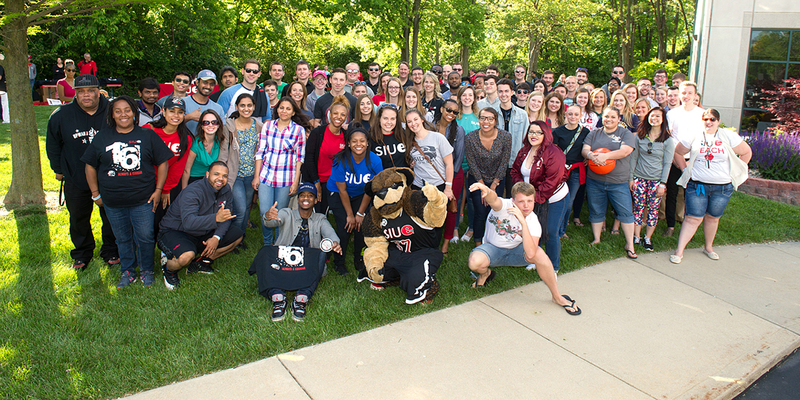 More than 335 awards, valued at more than $186,000, were presented to nearly 280 outstanding students spanning the College’s 20 departments and more than 80 programs. Increasingly high enrollment, rising academic qualifications of applicants, and a nearly 100 percent placement of graduates in engineering fields were among the major highlights Southern Illinois University Edwardsville School of Engineering (SOE) Dean Cem Karacal, PhD, shared with prospective students during the School’s first Admit Day held Friday, April 12. 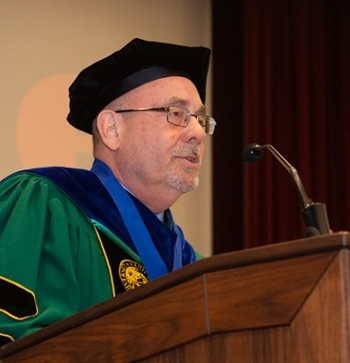 Southern Illinois University Edwardsville alumnus Peter Maer will receive the Interfaith Alliance Walter Cronkite Faith and Freedom Award along with Judge William Webster on Tuesday, May 21 in Washington, D.C. The Interfaith Alliance Foundation presents the Cronkite Award to individuals, who through their brave and selfless acts, have defended religious liberty and improved society. 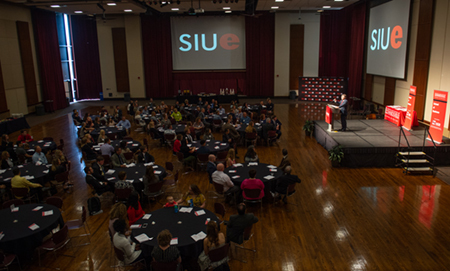 The Southern Illinois University Edwardsville School of Business celebrated academic achievement and recognized the value of donor support at its annual Scholarships and Awards Program held Wednesday, April 10 in the Morris University Center Meridian Ballroom. 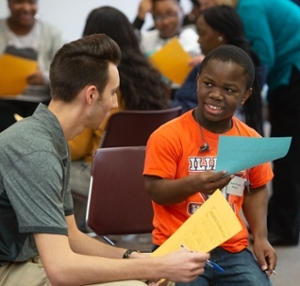 More than 100 students received scholarships valued at more than $200,000. School of Business Dean Tim Schoenecker, PhD, noted that the School’s incredible award total has nearly tripled over the past four years. The Southern Illinois University Edwardsville College of Arts and Sciences’ Criminal Justice Studies program and the Criminal Justice Club will co-sponsor a Criminal Justice Career Fair from 10 a.m.-2:30 p.m. Thursday, April 18 in the Morris University Center’s Goshen Lounge. 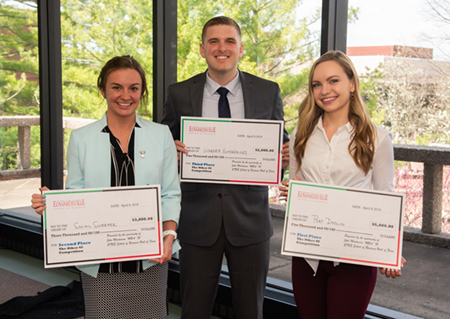 Southern Illinois University Edwardsville School of Business economics and finance major Margaret Doolin, with Port Doolin Investments, captured first place in the 2019 “TheOther40” Business Plan Competition. The School of Business hosted the competition for the ninth year, and held its final pitch event on Monday, April 8 in the Morris University Center. 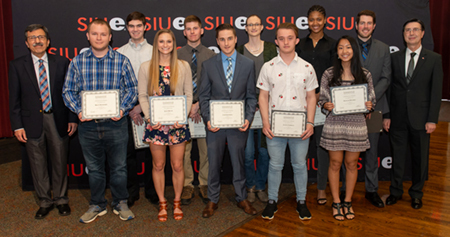 The Southern Illinois University Edwardsville School of Engineering (SOE) presented more than 50 scholarships valued at more than $45,000 to a number of outstanding students during its annual Honors Day program held Sunday, April 7 in the Morris University Center. In addition to the scholarship awards, fall 2018 dean’s list recipients were recognized for their academic achievement, and faculty members were acknowledged for outstanding teaching, research and service. 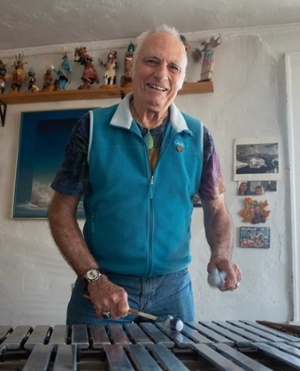 Lying flat on his back, not able to move and with a drain in his head, jazz musician Lee Roth, of St. Louis, asked the hospital chaplain for what he believed would assist in his healing. Upon receiving the boombox, Roth tuned the dial to Southern Illinois University Edwardsville’s WSIE 88.7 FM The Sound. 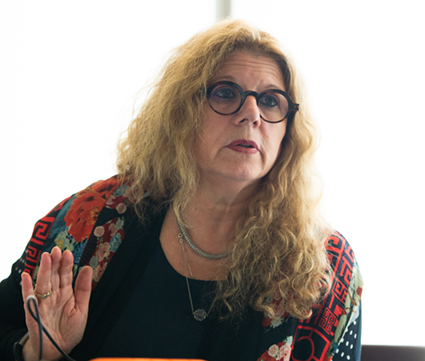 SIUE alumna Lisa Safarian, a prominent leader in the agriculture industry, has been elected to serve on the National 4-H Council Board of Trustees. 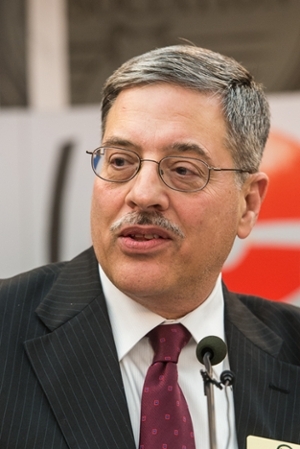 Safarian, of O’Fallon, Ill., earned a bachelor’s in business administration and a master’s in business administration from SIUE in 1988 and 1991, respectively. 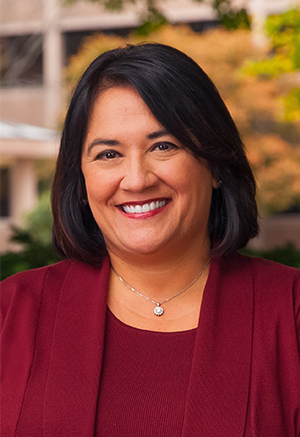 She is president of Bayer’s Crop Science North America Division. Details on her latest leadership position are available at 4-h.org. 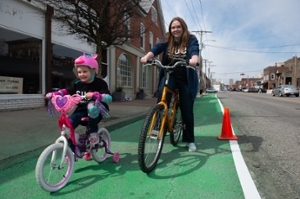 The students and faculty of Southern Illinois University Edwardsville’s Successful Communities Collaborative (SSCC) transformed two city blocks in Alton into a bike lane for a day on Saturday, March 23. 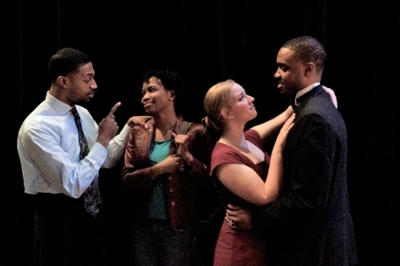 Southern Illinois University Edwardsville’s Department of Theater and Dance (DOTD) presents “Voices from the Front – Daughter, Son, and the War Within” by award-winning playwright Cassandra Medley. The production runs from 7:30 p.m. Tuesday-Saturday, April 9-13 and 2 p.m. Sunday, April 14 in the Metcalf Theater on campus. 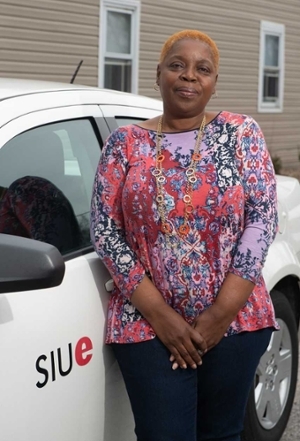 It wasn’t her first career choice, but Sandra Goodwin’s response to a need, and her desire to educate and empower others has earned the Southern Illinois University Edwardsville Head Start/Early Head Start teacher high marks and the 2019 Illinois Head Start Teacher of the Year award. 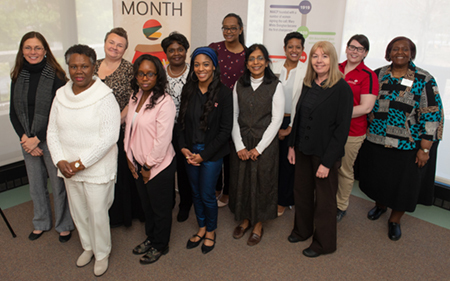 Southern Illinois University Edwardsville’s fifth annual Phenomenal Women’s Luncheon held Tuesday, March 26, honored 15 women, comprising faculty, staff, students and community members, for their incredible positive impact as people and leaders.